petite tabletop christmas tree in gift packaging. wooden trees in green, natural or black & white. price is for 1 (one) tree. special: $34.99 instead of $40.00. petite tabletop green christmas tree in gift packaging. celebrate the holidays in modern style this year with our petite tabletop collection of sculptural christmas trees. 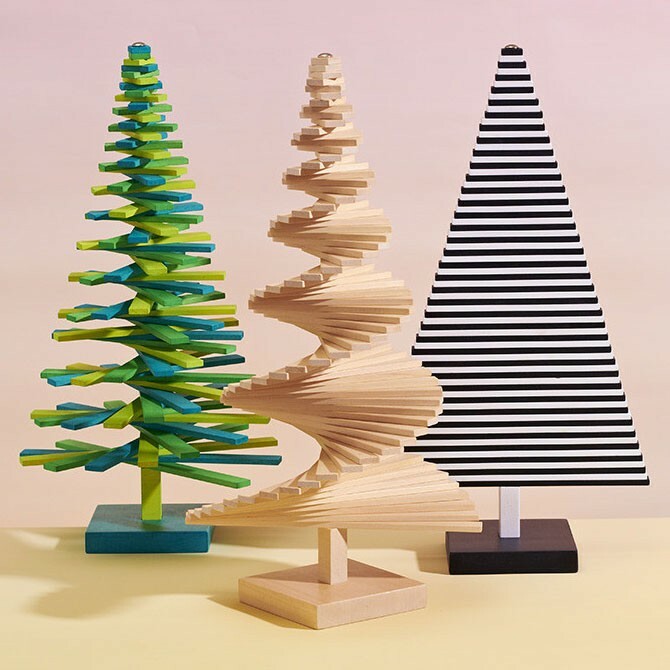 our modern holidays trees are fashioned with environmentally friendly new growth beech wood by master artisans. they are set on small wooden bases and have an attractive design. the inventive "infinite tree" features a design that allows for plenty of creativity and develops a new way of manipulating the tree's branches to achieve the look you want. a bit of creative enjoyment results in a beautiful yet maintenance-free christmas (green) tree. when the holidays are over, the trees can be stored flat-packed in their original box until the next holiday season. our beautiful collection of petite tabletop green christmas tree in gift packaging create the perfect holiday atmosphere. these trees are highly decorative whether adorning a dining room table or when displayed on a mantel.